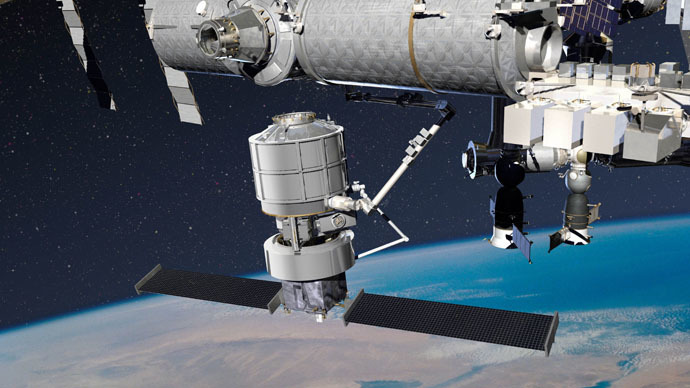 Lockheed Martin isn’t settling for simply resupplying the International Space Station (ISS) with its new spacecraft proposal – it also wants to host commercial payloads and support future missions into deep space. Dubbed the 'Jupiter' system, Lockheed Martin's proposed spacecraft is set to compete with other plans put forward by the likes of Boeing and SpaceX, as companies bid for an ISS resupply contract with NASA. SpaceX and Orbital ATK are currently sending supplies to the ISS, but their contracts run out in 2016, and NASA is looking to pick a successor by June. What makes Lockheed’s proposal stand out is its multi-purpose nature. Only one launch is needed to send up the Jupiter spacecraft, which comes equipped with a cargo container called an Exoliner. Once deployed from a rocket, the Jupiter craft would travel to the ISS and connect to the station, so that astronauts could remove supplies from the Exoliner and fill it with trash that has collected. After this, however, the spacecraft wouldn’t return to Earth, the Washington Post reported. Instead, it would linger in space and potentially carry out other missions, such as launching satellites. When NASA launched another resupply mission a few months later, the new Exoliner container would meet up with the container holding trash, and Jupiter’s robotic arm would swap the two. The old container with garbage would reconnect to the rocket headed back down to Earth, while the new Exoliner filled with fresh supplies would keep heading for the ISS. This cycle would continue, though its application wouldn’t be limited to the ISS. “Picture a future of interplanetary shipping lanes to the Moon and to Mars, with autonomous vehicles carrying supplies and scientific instruments and construction materials for habitats, robots in orbit for fueling, repairing, repositioning satellites,” James Crocker of Lockheed told Aviation Week. Lockheed believes this process will do more than simply reduce the cost of space launches for NASA. The company has proposed sharing profits with NASA if Jupiter begins carrying commercial payloads into space, Aviation Week reported. Looking to the future, Lockheed believes the Jupiter craft could resupply bases on the moon or even Mars. The Exoliners are large enough that they could even support the use of treadmills, for example, transforming the container into a human habitat as it floats through space.